We’d love your help. 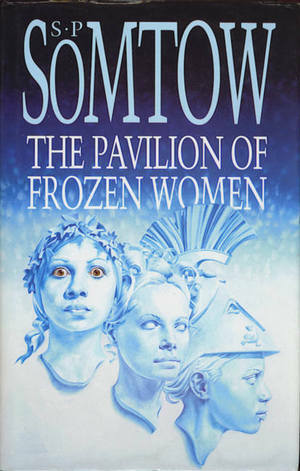 Let us know what’s wrong with this preview of The Pavilion of Frozen Women by S.P. Somtow. A collection of ten short stories, ranging from a modern-day Frankenstein in the suburbs of Bangkok to a detective exposing corruption in the entertainment industry. The book includes the Bram Stoker Award-winning "Darker Angels" and the World Fantasy Award-nominated "The Pavilion of Frozen Women". To ask other readers questions about The Pavilion of Frozen Women, please sign up. Een collectie korte verhalen van de Thaise schrijver Somtow. Ooit eens geleend uit de bieb van Manchester, toen ik daar in mijn jonge jaren studeerde. Beklemmend! Alle verhalen hebben een enorm beklemmende sfeer die je nog lang bijblijft. Called by the Bangkok Post "the Thai person known by name to most people in the world," S.P. Somtow is an author, composer, filmmaker, and international media personality whose dazzling talents and acerbic wit have entertained and enlightened fans the world over. He was Somtow Papinian Sucharitkul in Bangkok. His grandfather's sister was a Queen of Siam, his father is a well known international la Called by the Bangkok Post "the Thai person known by name to most people in the world," S.P. Somtow is an author, composer, filmmaker, and international media personality whose dazzling talents and acerbic wit have entertained and enlightened fans the world over. He was Somtow Papinian Sucharitkul in Bangkok. His grandfather's sister was a Queen of Siam, his father is a well known international lawyer and vice-president of the International Academy of Human Rights. Somtow was educated at Eton and Cambridge, and his first career was in music. In the 1970s (while he was still in college) his works were being performed on four continents and he was named representative of Thailand to the Asian Composer's League and to the International Music Commission of UNESCO. His avant-garde compositions caused controversy and scandal in his native country, and a severe case of musical burnout in the late 1970s precipitated his entry into a second career - that of author. He began writing science fiction, but soon started to invade other fields of writing, with some 40 books out now, including the clasic horror novel Vampire Junction, which defined the "rock and roll vampire" concept for the 80s, the Riverrun Trilogy ("the finest new series of the 90's" - Locus) and the semi-autobiographical memoir Jasmine Nights. He has won or been nominated for dozens of major awards including the Bram Stoker Award, the John W. Campbell Award, the Hugo Award, and the World Fantasy Award.